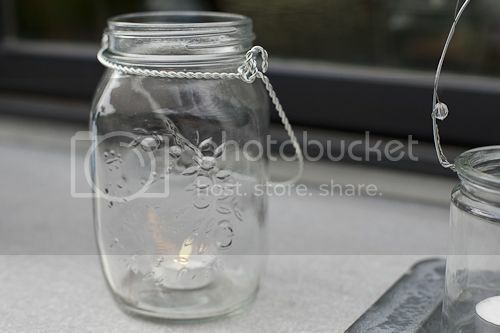 Glass Mason Jar with silver handle.This lovely Mason Jar glass with a braided silver wire handle and raised designs can be used with many candle options and either placed around your space or used as a hanging holder. Pair this with our Votive candles (time will vary from the 10 hour time as the space is larger for the candle to liquefy so burn time will be affected), tealight candles, 2x3 Pillar Candles, or pour some water and use our 2" Floating Candles. This product is sure to be a hit for weddings, outdoor entertaining, and home decor. Size: 3.75"(D) x 6.5"(H) with an opening of 2.75"
Complement your Eastland Mason Jar with Quick Candles large variety of decor and candles. Choose from a variety of colors, shapes, and products.